A local family is glad that Riverwood has therapists and providers who specialize in pediatric care. 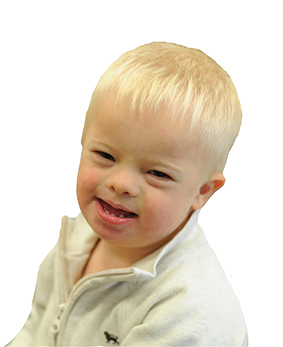 Having a child with Down syndrome, they know their son, Josh, age 2, is going to need a lot of specialized medical care and therapy in the years ahead. Amanda Rumpca, speech-language pathologist at Riverwood, specializes in pediatric care and loves working with children and families. She started treating Josh in September 2017. “Josh is such a fun patient!” Amanda said. “He brightens everyone’s day with his smile and personality. We have been working on increasing his expressive communication using a combination of verbal language and sign language. He has made great progress and is saying so many new words! Melody appreciates how patient and kind Amanda is with Josh. The family’s daughter, Elaina, age 1, also benefited from the pediatric expertise of Riverwood’s therapy staff. She had a condition called torticollis, a twisted neck condition with the head tilted to one side while the chin is turned to the other side. Melody also credits her children’s primary care provider at Riverwood with being very kid-friendly and responsive to her as a parent.